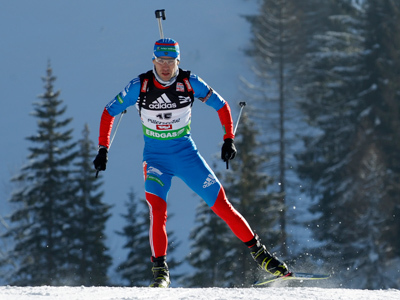 Andrey Makoveev has brought the Russian men’s team their first gold medal in the 2011/12 Biathlon World Cup. ­Makoveev was the fastest in the individual 20-kilometer race at the fifth stage in Nove Mesto, the Czrech Republic. The 29-year-old was the only athlete on the track who, despite the windy conditions, avoided a single miss on the shooting range. As a result the Russian won with confidence, beating second-placed Emil Hegle Svendsen of Norway, who incurred two penalty laps, by one minute. The bronze went to Sweden’s Bjorn Ferry, who crossed the finish line 15 seconds after Svendsen. "I really like the local track. It has great relief,” he added. “Many thanks to the organizers, who managed to keep the track in such good condition, despite the weather." 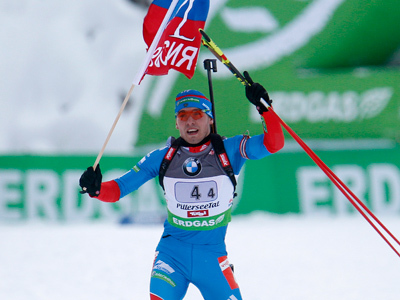 The Nove Mesto triumph became Makoveev’s first-ever stage win in the Biathlon World Cup.